Studio South East, large terrace facing the sea in tropical garden. Large studio facing the island of Marie Galante; its south / east oriented terrace is opened on a flowered and sported garden. This garden is completely enclosed by fences. Your car has a private location. 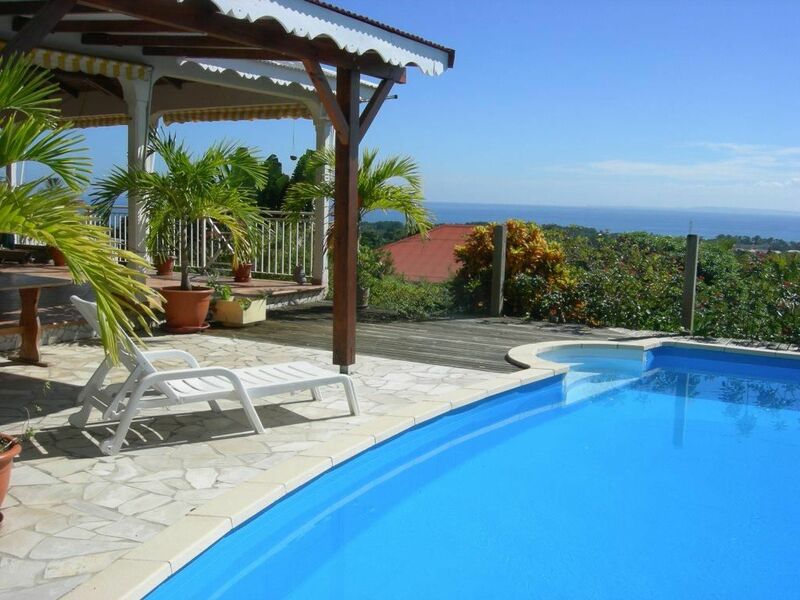 The villa, at the top of a 'morne' (hill) is on the heights of the city CAPESTERRE BEAUTIFUL WATER with beautiful views of the sea, sugar cane fields and banana plantations. 2 steps from the beaches of ROSEAU, BANANIER and 5 minutes by car from the village. Beside the mountain it is also close to the tropical forest of the SOUFRIERE massif and its volcano bearing the same name (1597m) and 3 falls of CARBET, the highest reaches 110m. Let yourself be charmed by the Creole atmosphere by contemplating the archipelago of the Saintes, the islands of LA DESIRADE and MARIE GALANTE in the distance but at hand in the turquoise waters. LA GUADELOUPE is waiting for you! ! Shower, sink and cabinet, toilet. Hot water. garden furniture: table, chairs and sun loungers. Hosts are realy kind and you will have all needed during your stay. Garden is very nice on the top of the hill with nice views. Good place for hikers, close to national park hiking trails. Perfect fit for our needs! Location was a little complicated to find via cell phone GPS so be sure to follow the provided instructions on how to arrive! Other than that...the KINDEST, FRIENDLIEST, MOST HELPFUL HOST!!! Their property is well secured, you are alone as much as you'd like to be and welcomed if you felt like company. If you are looking to explore the Island or other Islands surrounding, this is a great location and the right spot to be in. I'd recommend certain places to visit but we went everywhere so I can't single them out! Bring tennis shoes if you want to head to the volcano...flip flops aren't ideal obviously. Get to know the restaurant and grocery hours of operation. We often found they were closed or closing when we decided we were hungry. The operating hours are not what Americans are used to. I will suggest one place that I wish we knew about sooner...we stayed in a VERY average hotel night before our departure and it was at the Marina near the airport. If you locate Hotel Village Soleil, you will find the Marina. The parking area/surrounding restaurants will throw you off but, head to the waterfront of the marina and you will be pleased you did! VERY COOL VIBE, South Beach, Chic ambiance. Too bad we found it on the last night! Overall, would definitely return to their vacation retreat and explore some more!!! THANK YOU GRACIOUS HOST! Until we meet again. We've been using VRBO for years and these are some of the nicest hosts we've had. We arrived the night of Christmas Eve when everything was closed and they invited us up for dinner and drinks and we had a really lovely time with them. They were really responsive, helpful and enjoyable the whole time. The studio is private and has everything you need, including a great view! The property is located just a few minutes from the Chutes de Carbet, the three rivers marina to go to les saintes and the volcano (which I highly recommend doing). There are a couple of beaches close by but otherwise you need to drive to some of the nicer beaches. Overall it was a great location and what we loved the most were our hosts, who made us feel so welcome and at home. We really had a lovely time. This was our first HomeAway experience, and we could not have had a better first impression. The host, Mrs. Vincent, was extremely agreeable and kind. She welcomed us warmly and with a nice meal, as we arrived on a Sunday. She was available to us whenever we had a question, and we saw her a few times coming and going throughout the week, but we felt we had all of the privacy and comfort we needed. We explored Basse Terre (and some of Grande Terre) on our daily adventures, and were well situated to do so. We loved our time in Guadeloupe, and we look forward to returning. We would definitely look to stay here again! Many , many thanks for your nice assesment on ABRITEL site . It's also for me a great pleasure to know that our guests had a very good stay in our apartment and they had appreciated our little island : the Guadeloupe . It was also fine to know you and your two delightful boys . I hope you had a very good journey to come back home in Massachusset . Best wishes and I look forward to see you again one day in the future ! We enjoyed our stay! The Vincent's made us feel right at home. They were helpful and gave us tips where to go. One morning they brought us delicious fresh hot croissants. The location is excellent, you can easily drive to the beach, volcano and many other sites. We would definitely consider staying here the next time we go to Guadeloupe! This studio, in a couple's home, was a great place to stay while exploring Basse-Terre for a week. The owners were very welcoming and did everything they could to make sure I had what I needed for a fun-filled visit. They were always available to answer questions -- and were very generous with "welcome" and "goodbye" drinks, and a jar of delicious homemade soup. The studio itself was very clean and well-appointed. And the setting is divine! Well-worth the inexpensive price they're asking. Shops: 1km. Beaches: 3 km. KARUKERA or 'the island of beautiful waters ", like a butterfly landed on the Lesser Antilles, LA GUADELOUPE is the largest island, beaten by the ATLANTIC and lulled by the sea CARIBBEAN. What's better than a small holiday air when the greyness and routine resumed their rights? Pack your bags, do not forget your swimsuit and discover a little corner of France to 7000km from the mainland. Heading for the sun, relaxation and discovery .Come stay a more scenic in facing the island of Marie Galante. Caution : 200 € 30 pour cent à la réservation , le solde à l'arrivée .